Why participate in Small Groups? Small groups involve participants being empowered through encouragement by others. Enormous support is drawn in realising you are not alone in your experience, no matter how awful it is; there is great solace in knowing other people have felt the same way; that you are 'not the only one'. The sense of being understood and accepted differs in a group context from that in individual work, as within the group the participant experiences this acceptance from fellow members as well as the facilitator. There can be a richness and diversity in the types of relationships possible where there are more personalities and different types of people as in small groups. Group members often make friendships and alliances that endure beyond the life of the group. In a group, there is the opportunity for the discussion and debate of presented ideas. Members can feel more empowered to challenge ideas and adapt them to their own life situation. Also group members have the opportunity to learn from each other. Learning can become a shared collaborative endeavour, each person as well as the facilitator imparting information to the group. Group members are indirectly learning from each other all the time they experience and observe the interactions in the group. The group can become an enjoyable learning and therapeutic experience for members. Decrease each participant's sense of feeling alone with his or her problem. Impart information about mental health, spiritual growth and specific counsellee problems. Create a climate where participants can give and receive help, support, encouragement, and love. Provide feedback so members can learn how they are perceived by others. Teach new learning so people can change their behaviour and learn to function more effectively. 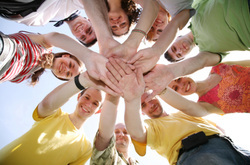 Help people acquire and practice social skills so they can learn to relate to others in more positive and mature ways. Give the opportunity to observe effective and mature behaviour as positive modelling. Provide opportunity for the expression of feelings in a safe environment. Give a sense of belonging, acceptance, and cohesiveness. Help people deal with significant issues such as personal responsibility, basic values, planning for the future, the meaning of life, or one's sense of self-worth. Provide opportunity for believers to pray, study Scripture, and seek divine guidance together.